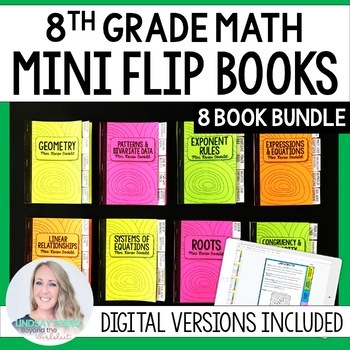 This resource provides a hands on and engaging way for students to review at the end of their 8th grade math units, or take notes as the units go along. 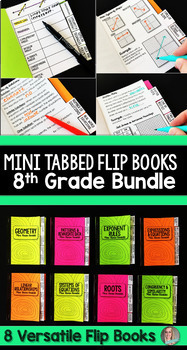 Each mini tabbed flip book has a front and back cover, as well as five pages that review skills for a specific unit. This resource is SO versatile because each flip book comes in two-three different completion levels - perfect for differentiation and scaffolding. Each flip book aligns perfectly with the units in my 8th Grade Math Curriculum. By purchasing this product, you own a license for one teacher only for personal use in their own classroom. Licenses are non-transferable and therefore can not be passed from one teacher to another. If the teacher who purchased this license leaves the classroom or changes schools, the license and materials leave with that teacher. No part of this resource is to be shared with colleagues or used by an entire team, grade level, school or district without purchasing the correct number of licenses. If you are a coach, principal or district interested in transferable licenses that would accommodate yearly staff changes, please contact me for a transferable license quote at lindsayperro@gmail.com. © Lindsay Perro. Please note - all material included in this resource belongs to Lindsay Perro Inc. By purchasing, you have a license to use the material but you do not own the material. You may not upload any portion of this resource to the internet in any format, including school/personal websites or network drives unless the site is password protected and can only be accessed by students, not other teachers or anyone else on the internet. ✮✮If you are interested in gaining access to an exclusive set of free resources,CLICK HERE.